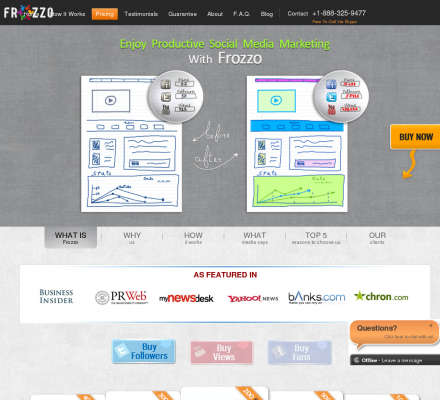 Frozzo Social Media Marketing Company - Frozzo. Frozzo.com was formed in 2010 in UK to provide its clients with any kind of services connecting with Social Media Marketing. This type of business is growing rapidly as it makes possible for network marketers and businesses to advertise through Social Media. Our team consists of a world - class group. Each of our members has the right experience to build your online presence. Description: Frozzo.com is a provider of Social Media Marketing Services that offers to get more fans, followers and views within a few days.